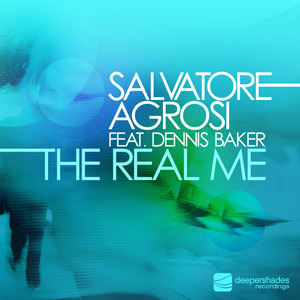 "The Real Me" is a collaboration between Deeper Shades Recordings artists Salvatore Agrosi (coming of the very successful Spirit EP) from Italy and Florida based vocalist Dennis Baker (featured on the "Hypnotize You" releases). Besides Salvatore's original mix, instrumental and dub, you can also find a bass heavy peak time vocal and dub mix by label boss Lars Behrenroth, an emotionally charged atmospheric builder by Salvatore's partner in their Mindtech outfit, Marco Fracasso and a stripped down interpretation as Salvatore's alter ego Toto. * Roberto Rodriguez "Oh hell yeah! Loving the Lars Behrenroth dub! The other mixes are great also! Thanks for the music." * Hector Romero "So difficult to check music while touring but I'm so happy I got the chance to get this GEM! Absolutely love it! Great feel. Full Support"
* Halo "Very nice project DSOH. All mixes are great congrats "Full Support"
* Nick Holder "I'm diggin this! " * Rocco "Nice remix by Lars, Feelin that sound !" * Fred P (Black Jazz Consortium) "Solid release Marco Fracasso Playin' With The Moon Instrumental hits the spot... Tip... "
* Alland Byallo "It's all about LB's dub! The other mixes are great as well, but I'm really picky about vocals and this one is definitely not doing it for me. I love the way LB brings some true house flavor but tastefully twists it into a classic techno bomb a la vintage F-Comm or Wave. Lars strikes again!" * Zepherin Saint "Hot Dub from Lars on this! will feature on the one tribe radio show!" * Owen Jay "I really like the Marci Fracasso Instrumental Mix. The serene & lush atmosphere, percussions and smooth strings will perfectly compliment the summer heat!" * Pirahnahead "MAN THIS IS SICK!!!!!! WILL BE IN THE ROTATION INSTANTLY!!!! " * Boddhi Satva "Nice Package, Feeling the Lars Behrenroth remix". * DJ Simbad "Really diggin the vibes here, ima play the Marco Fracasso A LOT. chartin / playin "
* Kai Alce "Lars' is dub is bangin!" * Joshua Milan "I love these releases. Great Job!!!!!!!" * Danny Krivit "Nice one, I like it"
* Vinny Da Vinci (House Afrika) "REAL REAL HOUSE HEADZ......TOUGH & BALLSY!!! LOVE THE LARS & MARCO'S MIXES!!! " * Manoo "Epic package... Floor-fillers at best... "
* Justin Sloe (Droog / Culprit) "I dig the spookiness of the Toto mix. Ace"
* Basic Soul Unit "Nice dub bro. That's the one for me." * Carlos Mena (Ocha Rec) "Dope package!" * Kiko Navarro "The Lars Behrenroth mixes are killers, liking also the original ones but Lars' mixes are the ones for my sets." * Rafael Moraes (Nomumbah) "Lovin' Marco Fracasso's Palyin' With The Moon Remix! Full support!" * DJ Minx "The dub and Lars B Remix are OFF the chain...Minx music all day!" * E-Man "Cool Package ... Will Support"
* Groove Assassin "Lars mixes SLAMM !" * Andy Compton "I love it!!! thanks :)"
* Luke McKeehan (Nordic Trax) "Loving this! Original dub and Marco Fracasso is doing it for me." * Jose Marquez (Tribe / Deeper Shades) "Nice package! The Marco Fracasso mix and LB dub are the one's for me, thanks!" * Demarkus Lewis "Lars kills this .. fav mix here and Marco does his thang also.. over all great release .. full support!" * Jesus Gonsev (Troubled Kids) "Solid Release!Lars remixes for me!" * Trinidadian Deep "LARS...that dub....is insane!" * Nils Penner (Penner & Muder) "Behrenroth Remix and Dub are really nice'n'heavy!" * DJ Rork "Nice package! Perfect for my peeps!!" * Distant People "Dub is standing out for me, strong groove keeps you movin"
* Irfan Rainy (Rainy City Music) "Lars dub to work it good !" * Fistaz Mixwell (South Africa) "Love it"
* Sarah Favouritizm "Lars' remix for me! Wicked stuff!!" * Just Mo (YFM, SA) "DSOH does it once again!!! Great release, quality deep house music right here. Can't get over the original & Lars' remixes ... 10/10!!!" * Tim White (House Afrika) "Marco Fracasso remix is hot too trot with infectious percussion groove and great vocals. Rocking." * King Britt "Marco Fracasso......hell yeah!" ^ available on The Real Me 12"